Alyssabeths Vintage: Back from Vacation, New Jewelry and a SALE! Back from Vacation, New Jewelry and a SALE! We are back from our wonderful family vacation and I have been crafting lots of new Romantic Vintage Style Jewelry just in time for my Christmas in July SALE. Use coupon code JULYSALE in my Etsy shop Alyssabeths for 15% off! 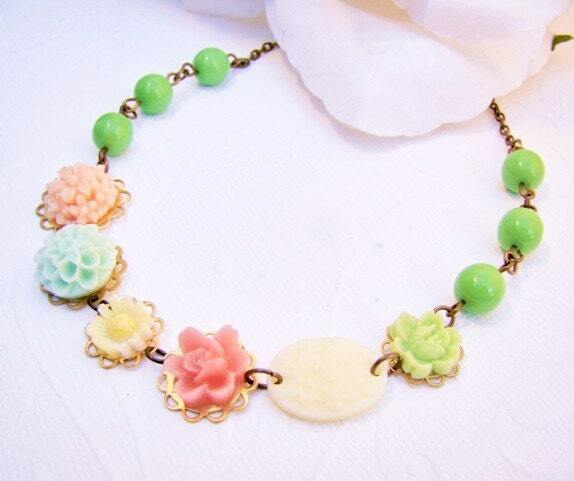 Grace Garden Necklace Sweet vintage style flower garden themed necklace crafted with 5 adorable flower cabochons in pastel pink, pale peach, sea foam, rose, ivory and aqua, set on a vintage mint green glass bead and antique brass chain. 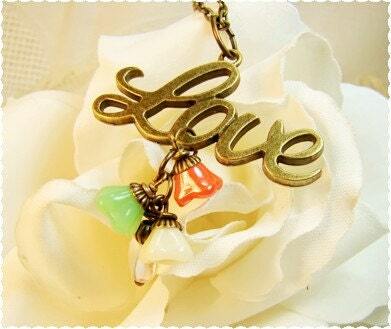 LOVE Flower Charm Necklace Romantic necklace crafted with a large antique brass LOVE pendant accented with dangles of glass bell flowers in ivory white, mint green & pastel orange with n iridescent glass heart with accents of oxidized brass bead caps strung from an antique brass chain. 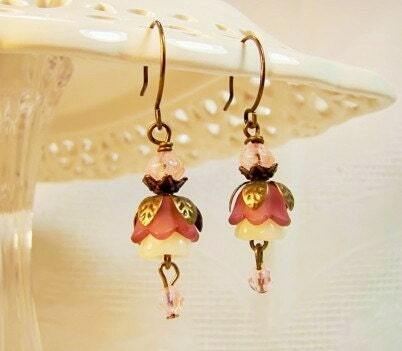 Belle Pink Earrings Sweet vintage style bell flower earrings crafted with layers of pastel pink glass and dusty rose Lucite flower beads, pink crystal beads and delicate antique brass leafy bead caps. These flirty little earrings are suspended on round “C” shaped antique brass French ear hooks and measure approximately 1 ½” when worn. 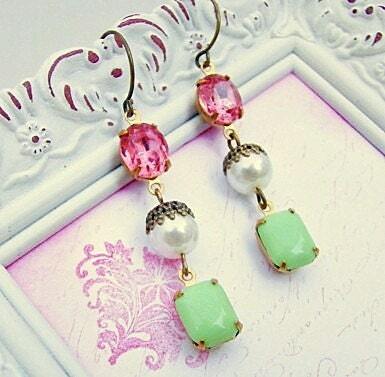 Pastel Pink and Mint Earrings Vintage style glam long dangle earrings created with vintage faceted oval rose pink rhinestones in antique brass settings, ivory pearls accented with lacey bead caps and vintage opaque mint green octagon glass jewels and are suspended from round “C” shaped antique brass French ear hooks. just running across this now- BEAUTIFUL colors ~ so happy and vintage-y. love these pieces.